I have been playing with PureOS installation options (the ultimate goal is to install it dual boot with MacOS on a MacBook Air, but this is out of the scope of this question). So, the question is: where is the source code of the PureOS bootloader installer? Am I just missing something obvious, or is it not actually available? The link provided does indeed point to a package repository, but that package repository also includes all the source code for the packages. All the tarballs contain source code: in the example you show, the various .orig.tar.xz files contain the upstream source, and the .debian.tar.xz files contain the distribution-specific patches applied to them. 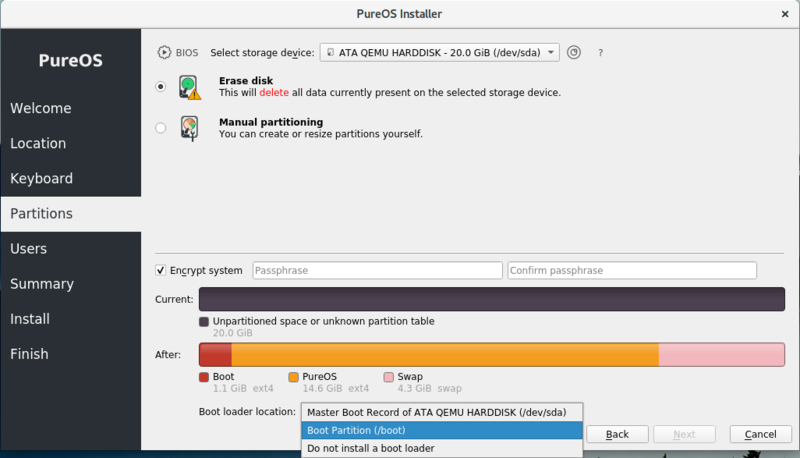 PureOS seems to use the Calamares installer framework; this is where the “Boot loader location” selection lives. You’ll find the source code for the PureOS version in the relevant repository, and all the PureOS core source code just above. Not the answer you're looking for? Browse other questions tagged debian-installer source source-code pureos or ask your own question. Where can I find the source code for /bin/ip? How does the X server emit a character when the keyboard is pressed?